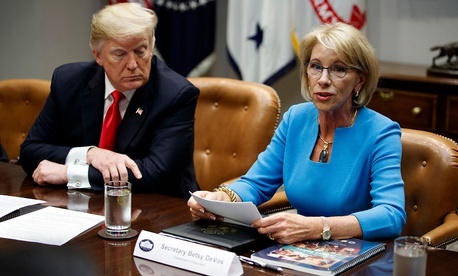 On Monday, Donald Trump’s administration released its budget proposal for the 2020 fiscal year, and the plan isn’t pretty for the Education Department. The proposal requests a roughly $7.1 billion cut in funding for the department compared with 2019, which represents a 10 percent decrease in its budget. The proposed cut is unlikely to go anywhere; like years past, Congress is expected to disregard it for the most part. Instead, more than anything, the proposal is an exposition of the administration’s philosophy on education: It is a state and local issue that the federal government shouldn’t have its hands in. At a granular level, the budget request looks similar to the ones released by the administration in 2017 and 2018. It would, again, eliminate a range of programs such as the Public Service Loan Forgiveness program, an incentive program that forgives the student loans of public-service workers, and there would be steep cuts to the National Institutes of Health, which funds a lot of research in higher education. And it would cut funding for teacher development under Title II, the part of the law funding preparation and pathways to develop better teachers. In contrast with the proposed cuts, the budget would increase the amount of spending on federal charter-school grants by $60 million. It would keep funding for historically black colleges and universities level, and expand availability of Pell Grants to short-term credential programs rather than primarily two- and four-year colleges. And this year, as a result of the Federal Commission on School Safety, the administration is asking for $100 million for new school-safety grants. The grants would help schools create emergency plans and improve access to counseling, mental-health services, and similar strategies to improve school climate. Each year, the budget request is joined by a chorus of reminders from policy wonks and lawmakers that ultimately Congress has the responsibility for setting funding levels. Congress has wielded that power during the past two budget cycles, rejecting the administration’s proposed cuts, and in fact has increased the Department of Education’s budget over the past several years. The administration is after “fiscal discipline,” Blew added, and there are higher-priority spending needs. That is unlikely to sit well with a Congress that has already shown its willingness to roundly reject the administration’s budgets.